Second baseman Robinson Cano (0-for-0, walk) and three ex-Mariners participated in Tuesday night’s MLB All-Star Game in San Diego, a 4-2 American League victory. Robinson Cano, Seattle’s lone representative in Tuesday night’s MLB All-Star game in San Diego, played only a cameo role in the American League’s 4-2 victory over the National League at Petco Park. Named to the AL squad as a reserve, Cano entered the game in the sixth inning as a replacement for Houston 2B Jose Altuve and walked. Cano, an All-Star for the second time as a member of the Mariners (seventh time in his career), worked the count to 3-and-2 against Jon Lester of the Chicago Cubs before drawing the free pass. Cano played three innings without a fielding chance at second base before giving way to Eduardo Nunez of the Minnesota Twins. Kansas City’s Eric Hosmer won the MVP award after hitting a solo homer and an RBI single. Teammate Salvador Perez, who beat the Mariners Thursday with a walk-off double at Kauffman Stadium, added a two-run homer in the second inning. By defeating the National League, the American League pennant winner will be the host team in the World Series. Three ex-Mariners — OF Mark Trumbo, RHP Fernando Rodney and OF Michael Saunders — also played. Baltimore’s Trumbo, who hit 13 home runs with 41 RBIs last year for Seattle and is the MLB leader in long balls this season with 28, entered in the seventh to face Lester. Trumbo reached on an error on SS Corey Seager (brother of Kyle). The Mariners swapped Trumbo to the Orioles in December for backup C Steve Clevenger, currently on the 60-day disabled list. Rodney, now with the Miami Marlins after a recent trade from San Diego, entered in the eighth to face four-time batting champion Miguel Cabrera of the Detroit Tigers, and struck him out. Rodney, who closed for the Mariners in 2014-15 before his release, also retired first-time All-Star Saunders on a pop to short. Those were the only two hitters he faced. That was the only at-bat for Saunders, who played two innings in right field and was final player selected to the AL squad. 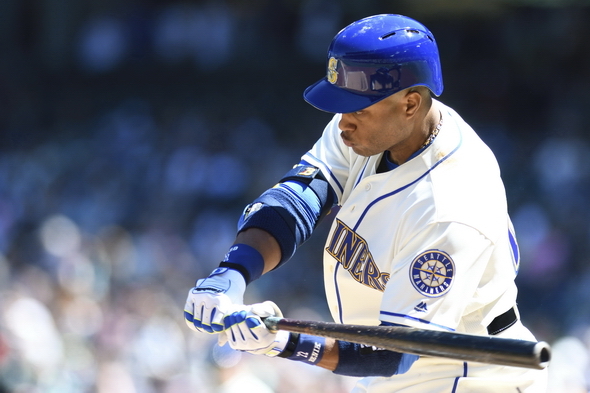 Saunders, batting .298 with 16 home runs, played for Seattle from 2009-14. The Mariners dealt him to Toronto in mid-2014 for pitcher J.A. Happ.